Vern Burkhardt (VB): "Celebration is an important skill in maintaining the health and vitality of a creative team. It inspires them." Would you give an example where failure to celebrate an important milestone achieved by a creative team resulted in negative consequences? Nigel Collin: I'm aware of quite a few which come from my own personal experience. I grew up in the entertainment sector, and was the Creative Director on large corporate and public events. Without mentioning any names, I remember one specific case where we'd been on a big event project for probably six months. The project, which was incredibly successful, came to an end but there was no celebration where we might have been told, "The results of the event project are awesome. You did a great job. Really appreciate it." There was none of that type of celebration, only a comment "Oh thanks very much." I remember walking away after this lame thank you thinking, 'Oh, are they not congratulating me because I didn't do a good job?' There is a kind of emptiness when you've been working on a project for a long time with a lot of other people, and so you need closure on it. When a project comes to an end a remark of "Oh, thanks very much; see you next time" leaves you with the feeling of 'Is that it?' You feel somewhat empty inside. What happens in your mind is you start to think you don't know if you want to work with those people again. The consequence is a negative feeling, and a feeling of not wanting to move forward with that same group of people ever again. VB: You also make the comment in Herding Monkeys that failure to have a celebration can make it difficult to move onto the next project without that closure. Nigel Collin: Definitely. It's almost like a hygiene factor. If you celebrate the end of a project you've got closure – 'wowee', we accomplished our goals, we did it. This part of my life, this part of my career is finished; I can put it aside. I can file it away mentally and physically, and now the slate is completely clean and I can move on. If a celebration doesn't happen, you leave with an uneasy feeling, 'Oh is that it? Did we not achieve what we wanted to achieve? Why didn't we celebrate our accomplishments.' What remains are mental baggage, and a feeling of being let down. Then when you move onto the next project you're not moving with a clean slate, because hanging over you is an air of non-closure. And it takes up needless mental space. VB: It also means that you can't recognize the accomplishment of others on your team and celebrate with them. Nigel Collin: It's important for them as well. We need to congratulate our creative people. "Guys, that was awesome! Thank you so much." When I was Creative Director we would throw big crew and cast parties. It's why movies and other creative projects have big parties at the end. It lifts your creative people higher, gives them the closure they need, and they feel good about themselves and about what they've achieved. It comes back to being a part of something bigger than you. When there's a celebration at the end, you think, '"Wow. I was part of that project. I helped achieve it and now we're celebrating it.' It's a full stop. To not celebrate would be like winning a Grand Prix and not being able to stand on the podium. It'd be like winning a Gold Metal at the Olympics and not being given the medal. You'd feel ripped off, and it would hang over you for a long time – perhaps for life. Getting up on the podium and receiving the Gold Medal is what you've worked for all your life as an athlete, and that's point. It's the closure and official recognition that you've finally done it! Celebrating is important to yourself as a leader, and to your team – everyone benefits! It's also important to not just celebrate at the end of a project, an accomplishment, or a financial year. You should celebrate key marks throughout the piece. If someone does come up with an idea that's going to change the project or solve a problem that you've been trying to work on for three months, you should celebrate. You don't have to throw a big party and pop open the champagne, but it means you say, "Wow! You know how long we've been on that? That's brilliant. Thank you so much. Now we can move forward." This approach keeps motivating and driving people forward to even bigger accomplishments. VB: What led to your analogy of the "intangible beast" for your book, Herding Monkeys? Nigel Collin: I don't exactly know. It popped into my head when I was speaking at a conference; probably the analogy made sense to me. Creativity is quite often deemed to be intangible, and it is intangible in many ways. We fight this way of thinking because business is highly tangible – we need a net positive bottom line, profit, and sales results. In business we need tangibility but creativity by its very nature often doesn't give it to you. Creativity is like an intangible beast – it's waffly and mythical. It's out there, we need it, but it's hard to define. Once you try to define creativity you kind of lose it so the intangible beast analogy made sense when it popped into my mind. What often happens in a company in our quest to get tangibility is we grab hold of the beast, and we lock him into a cage. We can then say, "Look! We have creativity." It may be contained, but in containing it you kill it because creativity needs to be free. It needs to be intangible. The analogy of the intangible beast probably fell out of my head while speaking at the conference because I'd been mulling it over without knowing I'd been doing so. I hate to tell you this – there was no system involved. VB: It was a creative idea from your subconscious mind. Nigel Collin: It is a good example of how creativity works. There's a great Buddhist saying, "To find the solution we need to forget the problem." You need to listen to your own creativity just as you need to listen to the creativity of your people. Often it will come at unexplained moments because the creative mind, the unconscious mind, has been working on it. When the creative idea comes you need to embrace it and not say, "No, no, no. Intangible Beast go away because I'm working on something else at the moment." VB: In your June 8th blog entry you say, "Be creative. If there's one thing I've learnt over the years its that creative people are always creating and people who always come up with ideas are always coming up with ideas." Is your message that creativity can be learned? Nigel Collin: Creativity can be learned because in a lot of ways it is a process. It's like playing a piano. Anybody can learn to play the piano, because in a lot of ways it's systemic, it's a process. You need to learn what the white keys mean, and what the black ones are. You need to learn how to read music to a certain extent, you need to learn your scales and understand a few laws and theories, and obviously you've got to practice. If you practice for six months or so with a basic understanding of how the piano works, you will inevitably be able to play the piano. Creativity is the same. If you can learn a few basics and a framework, and understand how creativity works, you can learn to be more creative than you are. Having said that, if I learn to play the piano, or a group of us learn to play piano, some of us are going to end up as Mozarts and others – probably like me – will end up bashing out some songs at a karaoke night. There are different levels, but it doesn't mean that people can't learn to be more creative. There have been lots of interesting studies that demonstrate that we can learn to be more creative, but the irony is as we go through life we tend to unlearn the ability to be creative. A gentleman called George Land did a study a number of years ago and, without going into too many details, he discovered that children scored lower on creativity tests as they got older. His conclusion was that we unlearn our innate ability to be creative as we gain life experience. We make more assumptions, take fewer creative risks, are afraid of ridicule, and generate ideas we think people what to hear rather than what they should hear. We learn to play it safe, and we come up with adequate rather than highly creative ideas. I prefer to describe it as we can re-learn to be creative, rather than learn to be creative. Some people have an innate ability to be more creative than others and therefore will end up more creative by comparison. However, all of us have a certain level of creativity to contribute. If we were to sum up this conversation, the role of a leader is to help people re-learn their creativity by nurturing, encouraging, inspiring, and allowing them to have the courage to tap into their innate ability. Ultimately this is going to be of great benefit to the organization. VB: In some respects we need to return to the innocence of childhood. Nigel Collin: Yes, the innocence. Kids tend to explore a lot more. Obviously they don't have the baggage we have accumulated as we go through life; they haven't been knocked down as much. I suppose if you give a child an empty box to the child it's a rocket ship, horse stables, a motorcar – it's all sorts of stuff. If you give an adult an empty box, they tend to put stuff in it. We need to get our mindset back to the child-like nature of the world. VB: In your blog entry on April 13th you say, "It worries me that in trying to get our people to be more creative we are in fact doing the equivalent of shoving our creative people into chicken coups, when what we really need to do is the equivalent of letting them roam free range." Is this possible given the pressures of deadlines and profit making in business? Nigel Collin: What I was saying is in our attempt to tap into creativity and make it more tangible we sometimes create cookie-cutter approaches as to how to come up with ideas and be creative, and we thrust these processes onto our creative people. It is in essence like putting a chicken in a coup. It contains their creativity. If you let your chickens have free range they will have a certain amount of freedom. You need to have a framework in place but not a systemic paint-by-numbers process. By sticking your creative people into a chicken coop, telling them how to be creative, and telling them they've got to lay an egg every 24 hours you're hindering the creative process. If you can find a way within an organization to let creativity flow, to let it be free ranging, you're going to get much better results. It doesn't mean let your creative people just go absolutely AWOL, because within the free-range you need to have a framework – you need to have fencing if you like. You need to have boundaries that your creative people have to work within. I'm saying give your people enough freedom to be creative – give creativity enough space to do its thing. However, don't let the creative process run rampant; you still have to guide it, and give it parameters and boundaries. Ensure you don't restrict and constrain it in a very tight, paint-by-numbers way. VB: Are profits likely to increase if you enhance creativity in your business? Nigel Collin: Yes, because you're going to find different solutions. Creativity is all about seeing the world differently. It's about finding unique ways of doing things, and you need to instill this approach in your organization. By letting your creative people throw ideas around and giving them the time and space they need, you're going to allow them to come up with better creative solutions. This is because they've got the time, space, and resources to explore and to play. If you contain them by saying, "I need an answer to this within the next 30 minutes and here's the thinking tool we're going to use," all of a sudden you've constricted their creativity. You will still get ideas but they won't be the ideas that are going to make the world different. You need to give them the space and time to explore, research, play, and to come up with solutions that are fabulously unique and different and that are going to change the playing field. That's not going to happen if you restrict their creative process. More creative ideas will mean better solutions to customer problems resulting in higher sales growth. VB: What are your skills and attributes that, in the words of one of your fans, make you "rock" at being a facilitator and a speaker at business events? Nigel Collin: It's really lovely to be described this way, isn't it? I've hung out with creative people all my life – even before I started my career. I seem to understand how to help creative people be more creative, which is really important. I'm pretty good at drawing the creative best out of people because it's what I've done all of my life. I'm able to get myself into the headspace of other people and find out what it is they're trying to achieve. This enables me to help people achieve their goals, rather than only bestowing information. Information is great but we need to do something with it. VB: Clearly you are enthusiastic and have fun. Nigel Collin: Yes, I have been described this way before. My philosophy is if you're not having fun, why do it? You've got to get people in the right frame of mind. It's how we learn and work to our best. You need to have a certain amount of energy and enthusiasm. If I wasn't enthusiastic about what I do, I shouldn't be doing it because otherwise I'm going to become robotic. If you don't have a fire or a passion in doing what you do, don't do it because you're not going to do it 100%. You're not going to be of optimum benefit to anybody. More importantly, you've got to get people into the right state of mind to have a good time, and then they'll come up with great ideas. Creativity's fun or at least it should be. VB: It should be all the time, right? Nigel Collin: Absolutely! Being highly creative is a serious game, but there's a lot of fun with it. VB: Would you talk about the Creative Catalyst Program? Nigel Collin: The Creative Catalyst Program is designed to help organizations develop a creativity strategy to help them plan to improve how they will use creativity. Creativity is a major driver of innovation – it fuels innovation. Without ideas and creative input you will have no innovation, because innovation is about implementing great ideas. The Creative Catalyst is a diagnostic tool that assesses the creative well being of your business. The result of the assessment phase of the 4-step process is to provide a detailed snapshot of the organization's processes of creativity, and where the organization needs to work in order to improve. It doesn't focus on outputs; rather, it measures the inputs. We ask a number of questions about an organization's leadership, culture, creativity, and how they nurture and use creativity. More than that it's a multi-level diagnostic, which means it helps identify the gaps. You might ask the leadership of an organization whether they have a great process and they'll say, "yes." You might then ask the same question of the people within the same organization whether they have a great process and they might say, "no,"
in which case we have a problem. Once we can see the gaps we know what areas an organization needs to target in order to improve it's creativity, and from this diagnosis we can start formulating a plan and strategy to improve those deficient areas. Recommendations are provided about which key areas should be focused on when creating a plan of action. We take on the role of mentor and guide, and check in at various times to ensure things in the action plan stay on track. We will facilitate certain aspects but often we are not involved in implementing the plan and strategy. Somebody else may have the required expertise – and this is fantastic. Our contribution is to later come back and measure the improvements that have been made by running the diagnostic again. This is usually done after about 6-months, and through this we measure and report on the changes and improvements that have occurred. We also offer suggestions for revising the strategy and further actions to be taken. VB: Do you administer the diagnostic tool in person or can it be done online. Nigel Collin: Either in person or it can be done online. VB: Online by going to your Creative Catalyst website? Nigel Collin: Yes, there's two parts to it. There's a diagnostic that enables you to have a look at the gaps in your organization. It's built around a multi-level survey; for example, a 360. It's a matter of logging in, and sending out links to people who are going to take the survey. Then it generates an online report, which is produced in real-time so you can see the results as they come in. The second part provides the option of a full report and implementation plan where we analyze the report and find out the areas that you need to focus on. This can also be done online but it's not a remote site process, it's a consultative process. VB: Earlier you said you offer mentoring and guiding. Does this entail mentoring of the leaders on what needs to be changed? Nigel Collin: Absolutely. As part of the deal when we analyze the report and give a list of recommendations, we'll meet face to face or have Skype meetings with the leadership. We indicate areas where we see the key issues are and the need for focus, and we mentor the leaders on how to improve those areas. As a leader you can do it yourself if you want, but at times it's important to have a third person to better see things currently in place, to nudge you along, and to guide you. They can provide a valuable sounding board. Mentoring is an important part of the process – I've had business mentors during my career. VB: A mentor can hold leaders accountable to make the key required changes for creativity to flourish. Nigel Collin: This is the scary part when you're being mentored. A mentor will hold leaders accountable to make necessary changes. And they provide leaders with a sounding board. VB: When will your next two books, which will be titled Creating Zoos and Shooting Ducks, be published? Nigel Collin: The next one will be Shooting Ducks, which is in process. I'm aiming for the end of this year. The third one, which is on creative culture, will be sometime next year – probably half way through if everything goes to plan. VB: Creative culture – the title of the book dealing with creative culture will be Creating Zoos? Nigel Collin: Yes, Creating Zoos. The analogy is you need to create an environment where creative people like hanging out with other creative people, and where they've got all the space and resources they need. It's not an old-world zoo where you stick people in a cage or a silo. It's like a New World, open-plains zoo or safari park where people feel quite safe to be who they are, and they have all the resources they need. It's about building culture. VB: Are you well along in drafting your second book? Nigel Collin: The second book is on the plate at the moment. I've got the structure of it ready to go. I've just got to write it, but that's not as quick as it sounds. VB: You've got to find the time? Nigel Collin: True, and there's a lesson for leaders. When I wrote Herding Monkeys I hired a condominium at the Gold Coast, which is 800 miles away from my office, and I stayed there for a week and wrote. With no distractions writing is all I did. I need to do that again. VB: Will there be additional books in this series? Nigel Collin: Not that I intend; however, there's certainly potential for other books in the series. I look at it as a three-piece series because they're the three key areas that a company has to focus on to nurture creativity. There may be something after that, but there are no plans at this point. VB: You were a member of the roundtable for the Queensland Government's 'Year of Creativity' in 2009. What were some of the lasting accomplishments of this roundtable, and were there frustrations for you as well? Nigel Collin: It was a fantastic initiative by the Queensland government, which is one of the states in Australia. The Year of Creativity was designed for the schools to nurture and help students in schools be more creative. I was on the initial round-table where we looked at how the initiative was going to happen. It is gratifying to look back and know I was part of it. The initiative was well implemented and made a difference. Queensland moved on the next year to the year, from memory, to sustainability. I suppose my frustration related to the fact that it was a state-based initiative of Queensland. I live in New South Wales where my kids go to school, and our state has not implemented such a program although I wish they would. I wish it could be a nation-wide initiative." VB: What are some of the best memories of the 9 years you owned and ran Absurd Entertainment? Nigel Collin: Probably my fondest memory is that I was involved in the Sydney Olympics in 2000. We held major contracts for entertainment outside the main arenas – what they called peripheral entertainment. Sydney has lots of live sites as most cities do where you can sit in the park and watch big screens. We created entertainment for all the traffic flow around the Olympic Park. It was an enormous challenge for an enormous event. Not only did Sydney pull off the Olympics well, but also we got through two weeks of more entertainment than I've ever produced in my life without a mistake happening. It was wonderful – a wonderful moment. Everything fell into place. We had an awesome team. Everyone gave their all. It was a lot of work with a lot of great creativity, and a good celebration at the end. This is certainly one of my fondest memories as far as projects go. My other fond memory was of hanging out and creating a family of performers and entertainers for the 9 years. We looked at our performers and the entertainers we used as being part of the family, and we went out of our way to make sure that they were happy and felt part of the team. We created a wonderful community and I'm proud of that accomplishment. Quite often performers and entertainers get commoditized – they're just talent. I can honestly say we didn't take that approach. People would fall over themselves to work with us because they knew they'd be brought into the fold, looked after, and paid well. It was wonderful for those 9 years to be involved in that environment. It's obviously where my current work related to creativity comes from – my love of all the creative people. VB: Did you have many employees or were they mainly free-lancers? Nigel Collin: All of the performers and entertainers were free-lancers, and it was a very deliberate move. I didn't want to own a performer so to speak. We created many of the entertainment performances we put on, but we'd hire and contract in performers to pull those off. I was keen that performers would be able to work on their own projects and with other organizations at the same time because it's not up to me to own them. We had employees to run the business, and usually they themselves were performers or had some sort of artistic, creative background. VB: How did you come up with the great name "Absurd Entertainment?" Nigel Collin: I'm going to completely disappoint you on this one. It was actually an existing company that did children's parties. I bought it, and then entered the corporate field with this name. I knew the person who was selling the business, and I said, "That's such a great name. I love it." And she replied, "Look I'm moving on. Do you want it?" It was an opportunity and I grabbed it, so I suppose the genius was recognizing the potential value of the name. It was great because we used to answer the phone, "Hello, this is Absurd." It gave us so much leverage. VB: Did you get the values for Absurd Entertainment right from the perspective of motivating your creatives, including your freelancers? Nigel Collin: Our goal, our purpose as an organization – our company vision, if you like – was 'We amaze'. Every time we worked with a performer we wanted to amaze them. We wanted our clients to walk away thinking, "These guys are amazing!" Underlying Absurd Entertainment was an undying value that I still have today of nurturing and inspiring the creative talents of people – you'll notice I've used those two words a lot in this interview. This is what I'm about. Yes, one of the reasons for Absurd was to make a buck but in order to do that we had to nurture and inspire the creativity of others. I knew that by doing this we would create a product and an organization that was almost unbeatable because we'd have the edge as opposed to just being an agent who would book stuff. I started working with performers from the outset because I loved hanging out with them, and I loved being a performer. As I looked around me it became apparent that performers needed to perform. I felt that if I could find a way to help them perform, it would be awesome. This approach was there from the start with Absurd Entertainment, and even in my work with corporations today it's still there. It's what I love. VB: Would you tell us about your quest to change the creative landscape of Australia? Nigel Collin: Creativity is an important part of our world. Obviously nothing happens until someone has an idea. Creativity drives business, culture, and community. It helps people with their self-esteem and to feel good about themselves. Australia is a much more creative and clever country than we give ourselves credit for. In fact, you could probably say that the citizens of almost any country. My quest is to change the creative landscape of Australia simply by encouraging people to be more creative, and to give them the belief that they can be more creative. I want them to understand that as a nation we're clever and we're ingenious, and I what us to celebrate it. In order to do those things my quest each day is if I, or if the people around me, can inspire another person to be more creative, then we will have changed the landscape of this country. If people can walk away thinking, 'I am more creative than I thought possible' or 'I did have a great idea', then obviously this adds fuel to communities, businesses, government, and our way of life. My quest is to celebrate and bring to the fore how creative we are as a country, and the fact that we can be even more creative. It's to encourage people to do it. Hopefully this quest will permeate out from Australia and ultimately change the creative landscape of the world. If this was to happen it would be awesome. VB: Are business, community, and government leaders hearing your message? Nigel Collin: Yes. Not necessarily mine specifically, but they are hearing the message about being more creative and innovative. In Australia we have the Innovation Festival which is run by the government around the country. I've just done a tour up the North Coast in regional Australia – so not the major cities – where innovation and creativity are being embraced on a government level. Of course, they can always be embraced to a greater extent. It might be said at times that it's possibly a little bit of tokenism, but it gives people the opportunity to explore, learn about, and celebrate innovation. And to have competitions. In our education system, as we saw up in Queensland, we are now more aware of the importance of creativity. Something is being done, there is movement, and the message is being heard. It could always be heard more, but in our world we're in a much better position innovatively and creatively than we were two or three decades ago. We're more attuned, and we understand the importance of it. As revealed in their "Capitalizing on Complexity" report dated May 2010, last year IBM surveyed 1500 CEO's in 33 industries from around the planet. About 60% of the CEOs said creativity was the most needed leadership skill moving forward during the next 5 years in a more complex world. The message has been heard not only within government circles and not just within Australia, but also all over the globe. In his book Flight of the Creative Class, Richard Florida discusses the important role society plays in attracting and supporting the talents of creative people – the "creative class." In his creative countries global index Australia is listed as twelfth in the world. I think we're better than that, and next time he publishes his index I hope we're in the top 10. There is a movement worldwide about the benefits of creativity and how it contributes to organizations' well being. There's a lot of good work now being done to further the message, but there's still a lot of work to be done. VB: Do you have any other advice about how to lead the creative talents of your people and turn their ideas into commercial results? Nigel Collin: If there was one piece of advice I would love people to take away it's this: Give people permission to be creative. By this I mean people aren't going to throw an idea on the table unless they feel they have permission to do it. They're not going to come up with those fabulously risky ideas unless they have permission to do it. They're going to stay in their corner, and not voice their creative ideas. It's important for the leaders of their organizations to give permission, to say, "We are a creative organization, we value it, we want you to come up with ideas, we want you to be creative, and we want you to find solutions that have never been found before." It's not about creating the next IPod all the time. Sometimes it's a slight creative adjustment to something that's already in place. Perhaps how you answer the phone can make all the difference with how you connect with your clients. If leaders can give permission for people within their organizations to be more creative then it's a fantastic first start. VB: As with the title of your published article in Not-For-Profit Management in May 2009, "A winning organization is a creative one?" Nigel Collin: I think it is a universal truth and the reason is this: All organizations need to be innovative. They need to find new ideas in order to compete, out-pace competitors, and find new ways of doing things in order to not just react to change but to instigate change. The world is changing faster than it ever has, and we need to change ahead of the curve. In order to find better solutions, better products for our clients, and better processes, we need ideas. If you look at innovation as a pipeline – you often hear about the innovation pipeline – in order to get the output from that pipeline, you need to have the right input. If innovation is the implementation of ideas, then creativity is the catalyst of those ideas. It's the generating, the coming up with the ideas. The better the creative input into the innovation pipeline, the better would be the solutions at the other end. Organizations that don't only embrace innovation but also embrace creativity are winning organizations, because they've got better fuel for their innovation pipeline. The result is they're going to come out with better innovative ideas. If you have poor ideas or few ideas going into your innovation pipeline you can still innovate, but it's not going to be as potent or powerful as if you feed that pipeline properly. Creativity is a vital mechanism, a vital catalyst, to creating better innovative solutions and that, in turn, will drive a business forward. VB: In another article titled "The Creativity of Space" you ask whether organizations' function space causes ideas to flow or eyelids to droop. Has it been your experience that eyelids droop in far too many businesses? Nigel Collin: Yes. I've done lots of workshops in grey, drab boardrooms. We need to stimulate ourselves creatively. The physical space around you has enormous impact on how you feel and think. You know this if you live in the city, and go for a drive in the country. The country air makes one feel very different. You're into sailing; I'm into motorbikes. Part of it, at least for me, is by being in a different environment we are put into a different headspace which refreshes us. It makes us feel different, we feel better. In order to spur on creativity, and in order to trigger the creativity within people we need to provide them with an environment that is welcoming to creativity and also stimulates it. This doesn't mean throwing beanbags around the place, but what it means is providing an environment that is bright, chirpy, and conducive to creativity. It also means an environment that is varied. If I'm stuck, if I've got writer's block for example, often just changing my physical environment will help. Often getting up from my desk and going to work outside, or taking my iPad down to a café can make all the difference. Yes, environment, your physical space, plays an enormous role in inspiring creativity. We need to understand this within organizations. For my money too many organizations don't get it. They have built their creative process and love people coming up with ideas, but they're not providing the right environment to allow it to happen in a big way. No doubt many are getting better at it – a lot of organizations are now refurbishing their environments with this in mind. But we've got a long way to go and yes, there are far too many grey and dingy boardrooms for my liking. You see it in schools, too. I've got two kids, an eight year old and a thirteen year old. In my eight year old's class the desks are a bit erratic, there's stuff hanging off the walls and the ceilings – its colorful and alive. When we go to my thirteen-year-old daughter's secondary school it's already starting to look like creativity is being stifled – the tables are aligned, and the walls are not as colorful as they used to be. It's not as conducive to creativity. You don't have to work in a clown castle or anything like that, but you have to create a space that is conducive to creativity. There are lots of experts who can help you design such space. Nigel Collin: No, I'm sitting here thinking we've pretty well covered most of what I believe is important. It's great you've done so much research; one doesn't often get that. Author Nigel Collin offers leaders many tips for how to motivate and provide the best environment to enable their creative people to thrive. He also reminds us that everyone has the capability to be creative to varying degrees, and we should motivate everyone to be the most creative they can be. The Creative Catalyst appears to be a useful tool for leaders wishing to assess and take action to enhance the creativity within their organizations, and to make lasting changes. 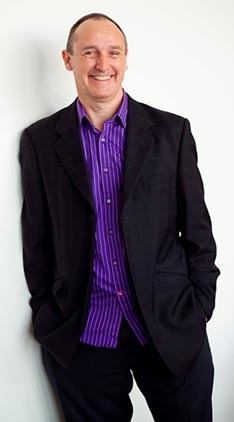 Author Nigel Collin is a dynamic, interactive, and practical speaker and facilitator. He has in-depth knowledge and a passion for creativity. With 15 years in the creative sector, he realized that the challenge with creativity isn't finding creative people or teaching your people to be more creative. It's knowing how to lead your creative people, harness their genius, and direct it towards viable business outcomes. For 9 years up to 2004 Nigel Collin owned and ran Absurd Entertainment, an entertainment design company. While heading this company he worked on a multitude of corporate and public events including the 2000 Sydney Olympics and Paralympics and The Sydney Royal Easter Show 1997-2003. He was Show Director for Australia's largest-ever corporate event in Sydney in 2005. He is a CSP (Certified Professional Speaker), the highest designation offered by the National Speakers Association of Australia. Nigel Collin is author of Herding Monkeys: How to Lead the Creative Talents of Your People and Turn Their Ideas into Commercial Results (2010) and Think BITS: Things to Get You Thinking Creatively (2010). His next book will be titled Creating Zoos, and it will be published in late 2011.